Thank you to everyone who joined us at the Royal Tandoori. We hope you all enjoyed the evening as much as we did! In September, Justus Miwanda, Director of International Needs Uganda (INUG) and his wife Deborah will be visiting us. On the 25th of September, we will be hosting a meal with Justus at the Royal Tandoori in Selsdon for all supporters and friends of International Needs. We would love for you to come and enjoy with us an evening of great food, company and to hear Justus speak about the ongoing Water Programme in Buikwe and the transformations taking place there. Whether you currently sponsor a child in Uganda, or have donated to our Water Projects in the past or are new to IN; we would love to see you there. Any proceeds from the evening will be going to our Water Projects, and the Royal Tandoori have kindly said that £5 from every ticket sold will be a donation to these projects! Please arrive at 7:00 pm for the meal to begin at 7:30pm. The venue is the Royal Tandoori in Selsdon, an established Indian restaurant serving both modern and classic Indian cuisine. The ticket provides a starter, main dish and a side of rice or naan. On the evening, every table will receive a set selection of dishes for the table to share so you can enjoy a variety of dishes. Please note drinks are not included in the ticket price. Please be aware that due to limited spaces, tickets will only be available in advance and will not be sold on the door. We are very glad for Justus to be joining us in the UK again this year. Since his last visit, huge progress has been made in INUG projects, not least the Water Programme. Through the 2017 Water Programme, over 9,000 people in Buikwe, Uganda gained access to clean, safe water. We built toilets, handwashing points and sanitation facilities for families, schools and communities around the district and provided education on safe hygiene and sanitation practice to thousands of children and adults. In 2018 the work has been scaled up to reach even more people and we want Justus to be the person to tell you all about it! 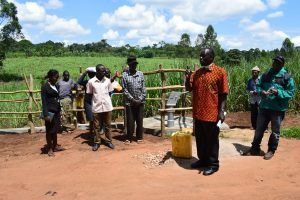 Justus handing over a new well to the community at a well commisioning ceremony in 2017.